Developed for NASA - COOL your sills! Reduce side sill AND interior temperatures up to 60 degrees with this space-age thermal insulation material! Works on ALL Vipers. Wraps directly around the exhaust pipe in the side sills. 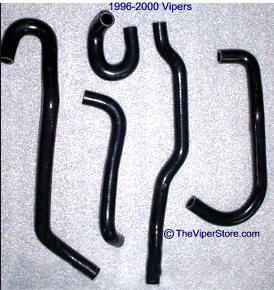 Kit includes enough material for both sides of your Viper with stainless steel tie wraps to ensure an easy do-it-yourself installation. Can withstand temperatures in excess of 2100 degrees Fahrenheit. 2 pieces (0.50" thick 24" wide x 5' long) plus 8 metal zip ties. Excellent for all applications where heat is a problem. 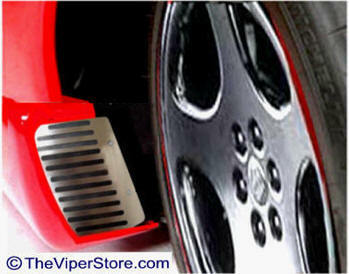 Dodge Viper (1992-2002) Side Sill Stainless Steel Cooling Vents - 25 degrees cooler! 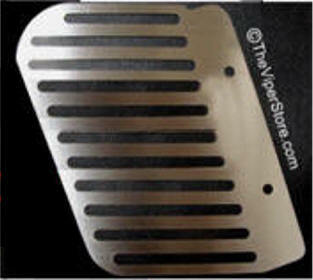 Stainless steel Viper Side Sills are made in the USA. These sill vents are made of high quality sturdy stainless steel and will never rust. They come in a Brushed Stainless finish or Black finish and are paintable. 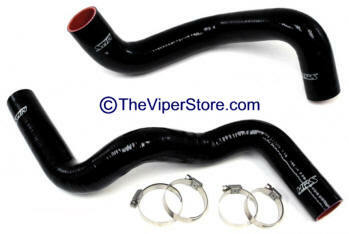 They are specially designed to work with the Dodge Viper 1992-2002 models. 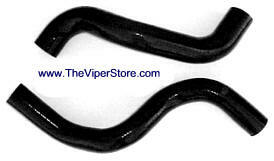 Cool your Viper Gills (set of 2) Create cooling of more than 25 degrees over stock. 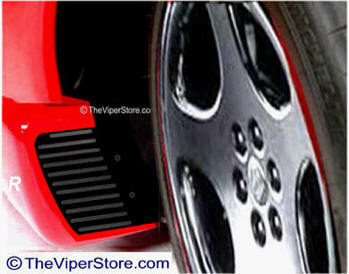 Mounts to side sills on 1992-2002 Dodge Vipers. High quality sturdy stainless steel. Complete Installation instruction and necessary hardware included. 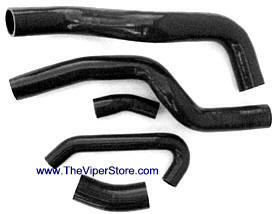 All Viper owners know how hot your sills and cabin can get with the Viper exhaust that runs through your rocker panels. 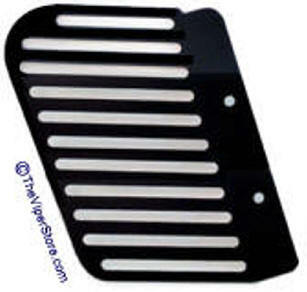 These vents are easy to mount and will last the life of your car. They allow cool air especially when you are driving while the hot air moves to the rear of rockers and is blown out. Comes with two vents and mounting screws. IPS-215 Dodge Viper (1997-2002) Blocking Device STOP AC from shutting off. You know when you accelerate how the Air condition cuts out? Well this device stops that from happening. STOP your AC from cutting out on Acceleration! 16" Fan Direct fits and uses factory bolts. Includes rubber flap vents for more reflective performance. Puller type fan (blows front front of car to rear.) 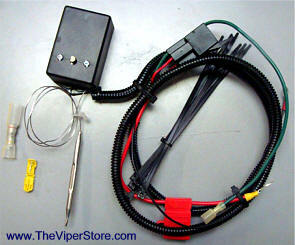 Converts wiring harness to single High Speed as opposed to the factory low and high speeds. Stainless steel housing will never rust. This High-Performance Electric Fans offer the ultimate airflow advantage. An enhanced motor design ensures maximum performance with longevity that's second-to-none. Each fan motor is sealed to IP68 standards, making them dustproof/waterproof. 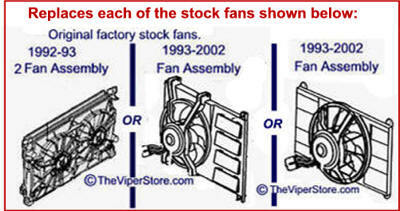 All fans are individually tested and balanced to guarantee the highest quality. 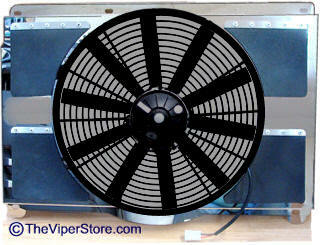 RR-RFCG12 Dodge Viper (1992-2002) Super Cooling Fan Control - We Highly Recommend this mod! 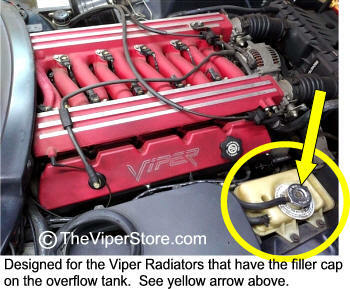 This device is the single most important thing you can do to your Viper to cool it down! NEW! You decide when your cooling fan comes on! Activates the fan at a user adjustable temperature and runs the fan after engine shutdown to help eliminate overheating and cool the engine faster. You simply set the fan to come at whatever temperature you chose and it will kick on automatically. Now features full adjustability to activate your radiator fan at any temperature you desire while the engine is running! 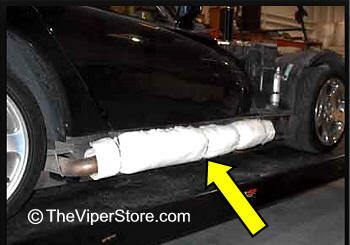 When you shut your Viper's engine off, the radiator fan stops running, no matter how hot the engine may be. Our kit automatically combats heat soak by cycling the radiator fan on as needed. A natural flow is created when the cooler water in the radiator sinks and is replaced by hot water through the upper radiator hose. All components needed for installation are included. Installation is easy! Done with simple hand tools in less than 30 minutes! No cutting, drilling or soldering required. 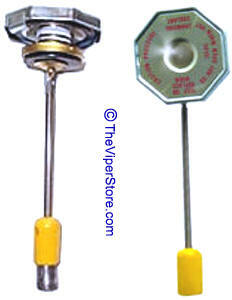 All high quality components including fused relay and stainless steel sealed temperature sensor. High Performance Cooling! You'll Love it! Vipers from 1992-3 came with 2 fans. This motor fits both sides. 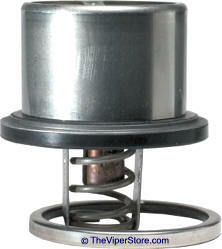 This Four Seasons fan motor is a replacement for factory original. This American made performance radiator is a direct replacement for the thinner cored factory unit on all 1994 to 2002 Vipers. Unlike the other radiators, it does not require the fan to be changed on 1994-1998 models, saving you hundreds of dollars. 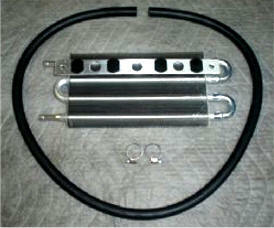 The triple pass allows the water to be cooled by running through the radiator 3 times before it exits! It features two one inch thick furnace brazed racing cores (no epoxy) and a triple pass design for maximum cooling. Comes with a one year warranty against manufacturing defects. 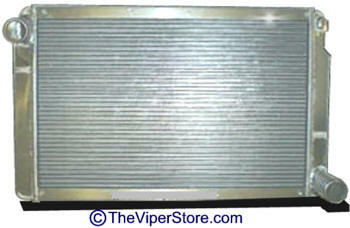 Made by a leading Race Radiator Manufacturer specifically for the Dodge Viper! Cruising down the highway with this radiator 2 a 170 degree thermostat installed, you can keep your water temperature down to the small mark one third of the way up the gauge, well below 190 degrees normal! All radiators are pressure tested to ensure you'll have no problems after installation. New mounting hardware included. For maximum benefit, consider adding a cooler thermostat and radiator fan control kit. NOTE: Slip fit with regular fan, will require 1/8 slight slice off the plastic housing of large fan. Will not fit on early Vipers with filler cap on the radiator itself. Product you order may look somewhat different than photos. 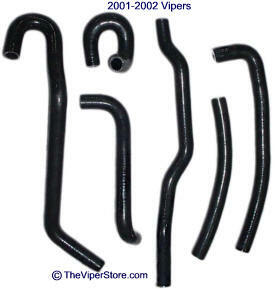 A complete set of Heater Hoses to compliment your silicone radiator Hoses. 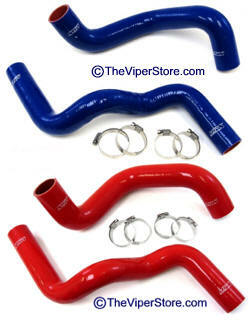 Contoured to match the original factory hoses that have been discontinued. Includes the water pump to coolant pressure tank, heater core to water valve, water pump to engine pipe, water valve to engine, and heater core to engine. Sold as a 4, 5 or 6 piece set in Black only; clamps not included. With road course track use, the stock Viper power steering system can overheat, damaging seals and causing the pump to fail. We have an upgraded aluminum cooler available that replaces the smaller painted steel original one. 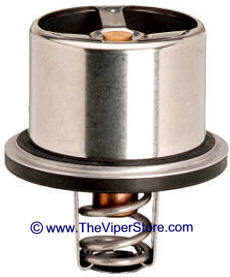 This helps eliminate the overheating problem and extends the life of your power steering system. Direct bolt on for 1996-2002 GTS and 1997-2002 RT/10. In 1992-1996 RT/10 requires additional U-Bolt mounting clamps.